Metropolitan Hilarion of Volokolamsk, chairman of the Moscow Patriarchate’s Department for External Church Relations, sent a message of condolences to Ms. Smet over the demise of her spouse, Mr. Wilfried Martens, President of the European People’s Party. The text of the message is given below. I was grieved to learn about the death of your spouse, Mr. Wilfried Martens, President of the European People’s Party. Please, accept my deep condolences. 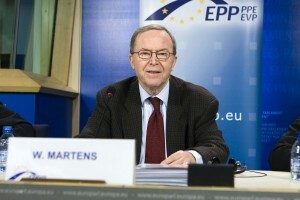 Mr. Martens was one of the most renowned political figures in Belgium and the whole of Europe. He had exerted much effort to promote European integration based on rich Christian heritage of the continent. I have warm recollections of our meetings with Mr. Martens. Our acquaintanceship began when I served as the Moscow Patriarchate’s Representative to the European International Institutions. In my heart, I will cherish the image of Mr. Wilfried Martens as a man who fought for the preservation of traditional values in the European society, was committed to developing spiritual ties between the people of Europe, and consistently supported the dialogue with the Russian Orthodox Church. The Moscow Patriarchate together with the European People’s Party are currently preparing Mr. Martens’s memoirs for publishing in the Russian language. Thus our country will pay respect and tribute to him. I pray to the All-Merciful Lord, asking Him to give rest to the soul of Mr. Martens, and empathize with you and with all his relatives and friends who suffer a great loss.